Is it possible for clinicians to provide in-depth therapy in the cost-conscious, time-limited world of managed care? This groundbreaking book offers clinicians new hope of maintaining professional satisfaction in time-effective practice. 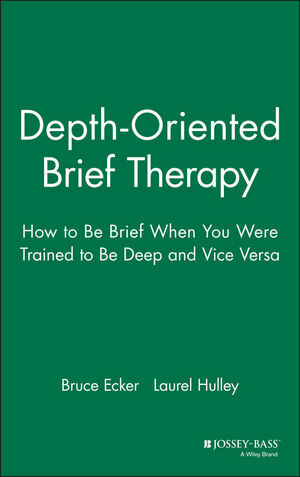 Authors Bruce Ecker and Laurel Hulley provide a practical guide for clinicians on how to work deeply and briefly with individuals, couples, and families, and shows how to meet the challenge of managed care without losing the deeper levels of change traditionally associated with long-term or existential work. By using Depth-Oriented Brief Therapy, you'll work directly and immediately with the emotional and unconscious meanings that structure the very existence of the presenting problem. BRUCE ECKER is a psychotherapist in private practice, teaches brief therapy at John F. Kennedy University, and is a clinical staff trainer at numerous mental health agencies. He is the coauthor of Spiritual Choices: The Problem of Recognizing Authentic Paths to Inner Transformation (1987). His work in psychotherapy follows a lengthy career in physics research. LAUREL HULLEY is in private practice and as Director of Clinical Training for Pacific Seminars develops and designs professional trainings in depth-oriented brief therapy. The authors, based in Oakland, California, are the originators of depth-oriented bried therapy. Introduction: Joining "Deep'' and "Brief'' in Psychotherapy. What Is an Effective Therapy Session? The Emotional Truth of the Symptom.